O’NEILL, MARGARET (baptized Marguerite Neill), named Mother Agatha, teacher and member of the Institute of the Blessed Virgin Mary in America (the Loretto sisters); b. 21 Sept. 1842 in Toronto, daughter of Thomas O’Neill (Neill) and Jane Ash; d. there 4 Feb. 1927. Margaret O’Neill was a teacher whose devotion to education left a considerable legacy for the Catholic women of Ontario. Little is known about her family background. Married in Toronto in 1836, her parents were Irish; her father, who may have been a labourer, was from Queen’s (Laois) County. The widowed Jane O’Neill who was a huckster at the St Lawrence Market in 1862-63 was likely her mother. Five sisters would survive Margaret. She attended the Toronto Normal School between 1861 and 1863, and graduated with a first-class certificate. It was here that she met second master John Herbert Sangster, who is described in an obituary as her mentor. She entered the Institute of the Blessed Virgin Mary in Hamilton on 21 Nov. 1866 and received the habit at Loretto House in Toronto on 6 May 1867, taking the religious name of Agatha. She made her vows on 12 Aug. 1869. When Margaret entered the Institute it was under the leadership of Mother Teresa [Ellen Dease*]. It had been brought to Toronto to provide education for the daughters of Catholics who could afford private schooling. Along with their select school, the Loretto sisters, as was their custom, set up schools for the less fortunate. In 1874 Mother Teresa established a school in Lindsay, Ont., where young women would be prepared to write the examinations of the provincial Department of Education. Its opening marked the beginning of the Loretto community’s involvement in accredited education and represented a significant shift for the Institute. To teach in Lindsay the nuns had to be professionally qualified. Recognized as having the credentials and experience that would allow her to move into a new realm of endeavour, Mother Agatha was one of the nuns chosen. She was highly determined - in early 1875 she lost a hand to blood poisoning but learned to write with her left hand. In 1880 she was sent to Guelph where, as principal, she presided the following year over the first conferral of certificates of matriculation at the Loretto school there. The length of her stay in Guelph is unclear, as are the dates of her teaching assignments elsewhere. She may have been at St Helen’s Separate School in Toronto in 1904-5. In 1877 she had participated for the first time in the governance of the community; she was then superior of a house and thus attended the general chapter as a delegate. She took part in the chapters of 1889 and 1910, again as a local superior. In 1901 she was elected a consultrix (assistant) to the mother general and continued in that capacity until 1919. It was the convergence of Mother Agatha’s concern for education and her participation in leadership that allowed her to advance the academic cause of women, both nuns and laywomen. At some point - at least by 1909 - she was given the responsibility of overseeing the educational preparation of the members of the Institute, a task that brought her into correspondence with officials in the Department of Education, notably deputy minister Arthur Hugh Urquhart Colquhoun and superintendent John Seath*. From the time the nuns had gone to Lindsay, the issue of the qualifications of nuns and religious brothers had been generating intense debate [see James Francis White]. Women entering the Institute were expected to teach, frequently before they had been adequately trained. Often the demands of teaching and of religious life combined to make it difficult for them to achieve the level of competence to which they aspired. Mother Agatha fought for her sisters to have time to study, and she is remembered in the community for her stance in this regard. 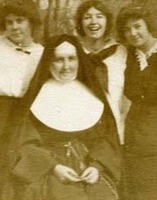 From 1908 there is evidence that Mother Agatha was also engaged in the community’s struggle to establish a college for Catholic women at the University of Toronto. It was during the tenure of Mother General Stanislaus Liddy that Mother Agatha’s years of negotiation with the university and the Catholic college there, St Michael’s, bore fruit. In October 1911 an agreement was concluded between St Michael’s and the two Catholic women’s schools in Toronto, Loretto Abbey and St Joseph’s Academy, with students to be formally enrolled in St Michael’s. Loretto College opened its doors in 1912 with 15 students under Mother Estelle Nolan and the first class graduated in 1915. It was seen as a crowning achievement for the community, particularly for those who cherished a vision of the highest possible education for women. A beneficiary of Mother Agatha’s insistence on education was Mother Margarita [Mary Cecilia O’Connor*], the college’s dean from 1914 and an outspoken advocate of giving the nuns extended periods of time for study. AO, RG 2-128-1-2: 15, 24, 34, 48; RG 2-128-4-1; RG 2-128-6-1-2; RG 80-8-0-1050, no.1752. Arch. of the Roman Catholic Archdiocese of Toronto, Religious orders fonds, Loretto sisters (IBVM), University affiliation, 1911-13. Institute of the Blessed Virgin Mary (Loretto) Arch. (Toronto), Loretto College files; Loretto School records, Guelph, Ont., and Lindsay, Ont. ; Mother Agatha O’Neill file; Mother Margarita O’Connor, personal papers. St Paul’s Roman Catholic Church (Toronto), Reg. of baptisms, 9 Oct. 1842 (mfm. at Arch. of the Roman Catholic Archdiocese of Toronto). Globe, 5 Feb. 1927. M. G. A. [Mother Agatha Allison], An old song in new meters (Toronto, 1924). E. M. Brewer, Nuns and the education of American Catholic women, 1860-1920 (Chicago, 1987). Barbara Cooper, “‘That we may attain to the end we propose to ourselves’: the North American Institute of the Blessed Virgin Mary, 1932-1961” (phd thesis, York Univ., Toronto, 1989). Sister Mary Aloysius Kerr, Dictionary of biography of the Institute of the Blessed Virgin Mary in North America: lives of the members of the Institute of the Blessed Virgin Mary in North America from its beginnings in 1847 to 1983 (Toronto, 1984). F. A. Walker, Catholic education and politics in Ontario . . . (3v., Toronto, 1955-87; vols.1-2 repr. 1976), 3. Barbara Cooper, “O’NEILL, MARGARET, named Mother Agatha,” in Dictionary of Canadian Biography, vol. 15, University of Toronto/Université Laval, 2003–, accessed April 24, 2019, http://www.biographi.ca/en/bio/o_neill_margaret_15E.html.